The Miami HEAT host the Washington Wizards Saturday night at AmericanAirlines Arena. Get your tickets now! Tip-off is set for 8:00 PM, and television coverage is on FOX Sports Sun. You can also listen to the action live on 790 The Ticket. 1: What happened down the stretch against Indiana that Miami can clean up with the quick turnaround? Couper Moorhead: After Miami took a six-point lead with 3:50 to play the Pacers embarked on a 12-2 run to seal the deal. It was an odd game full of whistles and missed free-throws where neither team seemed to get into much of a rhythm – despite Miami being over 60 percent from three midway through the final period – and the evening simply came down to the Pacers making a few plays when the HEAT struggled to generate offense. With Goran Dragić and Dwyane Wade out it was up to the younger players to find positive-value in those late-game possessions but a game after closing things out against the San Antonio Spurs, and two games after Richardson finished off the Pistons in overtime, it was a struggle against Indiana’s quick hands and lengthy defenders. Richardson and Justise Winslow got the majority of those late-game touches and it was definitely a learning experience for both – something that’s going to happen to any players thrust into a featured, load-heavy role in big spots. What was unique about this game is that the Pacers contained Miami’s actions well and stayed in front of the ball, forcing ballhandlers to attack a set defense. Sometimes you’ll be able to generate offense off your sets and playing off your defense, but there will always be games where you have to brute force the ball into the rim in the half-court. These are reps Miami’s young players needed. 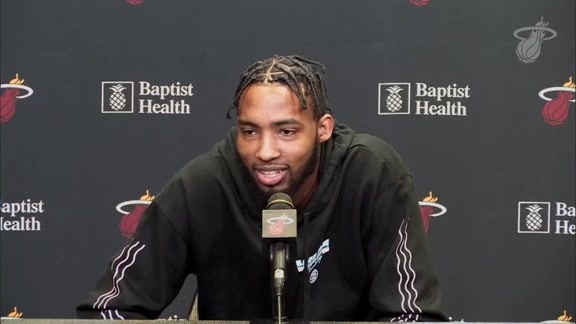 Joe Beguiristain: With some key contributors sidelined and a lot of guys out of rhythm due to foul trouble, the HEAT struggled down the stretch in yet another close game. Sure, Josh Richardson and Justise Winslow had their moments and combined for 17 of Miami’s 22 points in the fourth, but Indiana made things difficult for the duo more often than not. That said, it’s important to remember that the Pacers entered the night as the No. 7 ranked defense (they're now fifth after Friday night’s performance) and are among the league’s elite at scoring off turnovers. That unfortunately rang true against the HEAT, as Indiana scored 29 points off Miami’s 24 miscues. If there was one bright spot for the HEAT, it was the play of their bench. Kelly Olynyk led the team in scoring and had a monster second quarter, Tyler Johnson did his thing from downtown and set up his teammates well and Derrick Jones Jr. made some nice hustle plays in the third quarter. Regardless of who’s in or out of the lineup on Saturday, it’ll take that kind of collective effort from the bench to be victorious. 2: What did we learn from Miami’s last-second victory over Washington in the first week of the season? Couper: It feels like a year ago that Kelly Olynyk rebounded and put-back a Wade miss in the final seconds, but less than a month have passed since that night. It was Miami’s first experience of the season with the new speed of the league, well before they played Sacramento and Atlanta, as Washington scored 20 fast-break points and finished with a pace of 105 possessions. But what we learned that game was what we’ve known about the Wizards for a few years now: their bench can struggle and should be an advantage for Miami’s depth when they’re healthy (Dragić may return Saturday night) and in a close game they can get hung up in their half-court offense. The Wizards were up one with the ball in the final 30 seconds of that game and the HEAT simply played off John Wall and dared him to shoot a three. He did, and missed, setting up Olynyk’s hustle winner. We may not have learned much new about the Wizards, but that we were reminded of the things that have stayed the same in this matchup may have been important knowledge on its own. Joe: In that last matchup against the Wizards on Oct. 18, we saw Richardson blossom in the clutch on both ends of the floor. In addition to scoring 13 points on 4-of-7 shooting in the fourth, he also defended John Wall quite well down the stretch. In total, the 25-year-old held Wall to 0 points on 0-of-2 shooting in 27 possessions against the five-time All-Star. Then again, it was Jones Jr. who came up with a huge deflection on Wall on a sideline out of bounds play with 0.2 seconds left. At the end of the day, containing both Wall and Bradley Beal as much as possible is the key to stopping Washington. And since Miami was able to do that in the fourth quarter (the duo shot just 3-of-8 combined in the final period), it earned the victory. We’ll see what transpires this time around. 3: From the outside looking in, what do you see that’s behind the Wizards’ struggles so far? Couper: We don’t need to dig too deep into the struggles of another team, bizarre as it is to see a team this talented at 2-9, but it’s clear that their defense has left something on the table so far. Washington’s offense has lagged a bit because they’re shooting just 32 percent from three and that should regulate itself sooner or later. On defense, however, they’re No. 29 in the league allowing 114.6 points per 100 possessions – a full seven points per 100 worse than their No. 15 defense a year ago. Fortunately for them, Dwight Howard has returned after missing the opening weeks and both the defense and rebounding rates (they’re No. 29 in defensive rebounding at the moment) have looked healthier with him on the court so they may begin to trend upward. Either way, the Wizards are too talented to have a record like this for long and a far, far from a typical 2-9 team coming into Miami Saturday night. Joe: As Coup mentioned above, the main reason why the Wizards have struggled this year is because of their poor defense. Not only do they allow opponents to shoot 64.4 percent in the restricted area (albeit off just 29.1 attempts per game, which is actually less than what most teams give up), but they also let the opposition convert 38.4 percent of their 27.5 above-the-break threes per contest. Having said all that, Washington is a team that can hang around due to its offense. That was on full display Friday, as Wall, Beal and Kelly Oubre Jr. nearly brought the Wizards all the way back after being down by 25 to the Magic in the third quarter. Simply put, Saturday should be interesting. The HEAT have won eight of their last ten games against the Wizards. Josh Richardson leads Miami in scoring at 20.5 points per contest. Bradley Beal leads Washington in points (23.0) and blocks (1.2) per game.